We, the Commission One of the International League of Peoples’ Struggle, oppose the 42nd G7 summit meeting which will be held at Ise-Shima area in Mie prefecture, Japan on coming May 26-27, 2016. We express our solidarity to protest actions against the meeting in Japan. 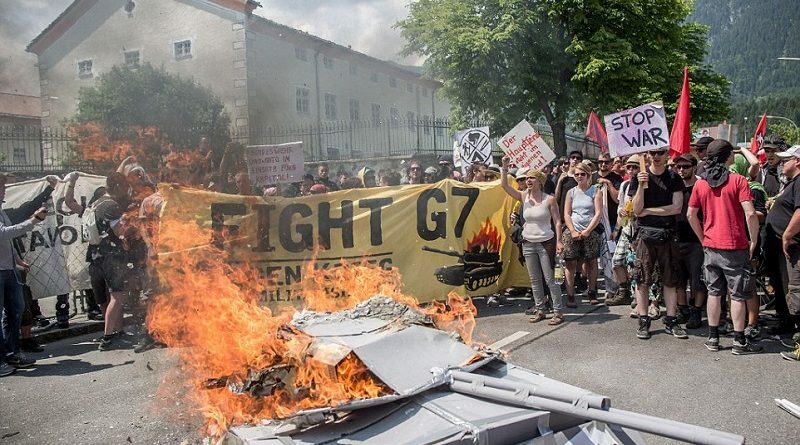 The G7 summit is an exclusive meeting of world imperialist leaders who represent the interests of big monopoly capitalists and transnational corporations. The so-called ‘world leaders’ never represent the interests of oppressed and exploited people of the world. They have brought tremendous sufferings to the people in different continents through their promoted wars of aggression and neoliberal policies. This year’s G7 summit meeting will be held amid the deepening crisis of world capitalism. Monopoly capitalists and their governments can never resolve the crisis essentially. They just try to shift the burden of this crisis to workers and people, carrying our massive battle in global arena for expansion of their markets and plunder of resources. The G7 summit leaders intend to expand wars of aggression, intervention and oppression in the Middle East and the rest of world under the guise of ‘countering terrorism’ through adoption of ‘‘G7 action plan on countering terrorism’. In addition, they aim to further expand oppression to all forces which are fighting against imperialism by creating the ambiguous concept or ‘violent extremism’. This year’s G7 summit meeting, which will be held in Japan as a close ally with the United States in the Asia-Pacific region, will be a venue for support to the U.S. strategic pivot to the region. They plan to consolidate military encirclement of China under the name of ‘maritime security’. They are also intensifying their threat to the DPRK one-sidedly. Japan’s Abe administration, taking advantage of its position as host country of the G7 summit meeting, aim to further raise its position within world imperialist powers. The administration, which forcibly enforced the new security legislation last September, intends to expand its own military influence in the region, waiting for its chance to send its own military forces to battlefields abroad. The reactionary and right-wing Abe administration plans to use a venue for the G7 summit meeting as a means to justify and beautify the Japanese Emperor system. Prime Minister Abe sets the venue of the G7 summit meeting this year on Ise-Shima because the Ise Shrine, which is closely related to the Japanese Emperor system, is located in the area. When Japanese imperialism carried out the wars of aggression and colonization in the Asia-Pacific region, the Emperor system took a key role for mobilizing of Japanese people to support these. Present Japanese Emperor, however, does not recognize the responsibility of emperor worship until now. We, the Commission One of the International League of Peoples’ Struggle, support Japanese people’s protest actions to counter the G7 Ise-Shima summit meeting which plans to push through wars of aggression and neoliberal policies. We support the Japanese people’s protest actions to counter the G7 Ise-Shima summit meeting. At the same time, we condemn the unjust arrest on May 19, 2016 of three leaders of Asia-Wide Campaign, a member organization of the ILPS. It is clear political repression and preemptive attack against the people’s resistance. People of the world, unite to resist imperialist war of aggression, oppression and plunder!